Signet ring cell gastric carcinomas are characterized by poor prognosis and potential to infiltrate the gastric wall. Until 29% of patients with gastric cancer had a signet ring cell type histology and appears to have a higher frecuency among females and young patients. 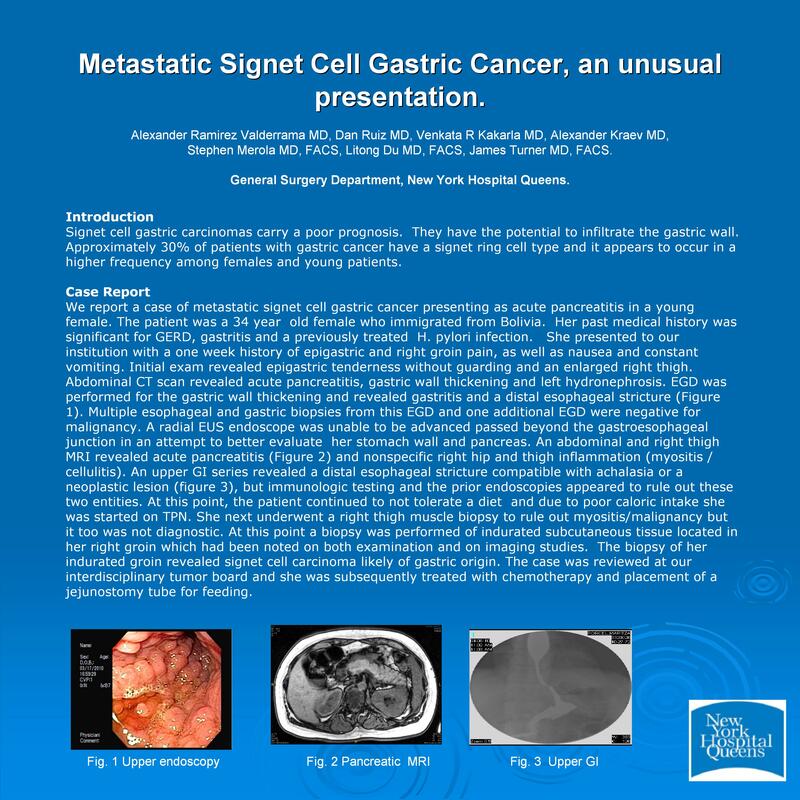 We report a case of metastatic cell gastric cancer clinically presented initially as acute pancreatitis. This is a 34 years old female immigrant from Bolivia with history of GERD, gastritis and H. pylori infection medically treated, presented with history of one week of epigastric and right groin pain, nauseas and constant vomiting. Abdominal exam shows epigastric tenderness without guarding. Abdominal Ct scan shows acute Pancreatitis, gastric wall thickening and left hydronephrosis. EGD shows severe gastritis and distal esophageal stricture, multiple esophageal and gastric biopsies from two EGD, all of them were negative for malignancy. The radial EUS endoscope was unable to be advanced passes the GEJ. Abdominal and right thigh MRI shows acute pancreatitis and unspecific right hip and thigh inflammation (myositis / cellulitis), patient continues with oral intolerance and TPN is started. Right thigh muscle biopsy is negative, all immunology tests were negative and upper GI series shows distal esophageal stricture compatible with achalasia or neoplastic lesion. Chest CT scan shows distal esophageal and gastric wall thickening and finally after 3 weeks of work up right groin biopsy shows gastric signet cells carcinoma. Patient was discussed on GI meeting and decided start on chemotherapy and jejunostomy feeding tube placement.